A small Yorkshire mining town is suffering the throes of the Thatcher recession. The mine is threatened with total shutdown which would also put an end to the Grimley Colliery Band, a brass ensemble as old as the century-old mines. Danny Ormondroyd the indefatigable conductor insists the men keep rehearsing for the national competition no matter what happens. The band members however believe they have no hope until Gloria appears carrying her Flugelhorn. 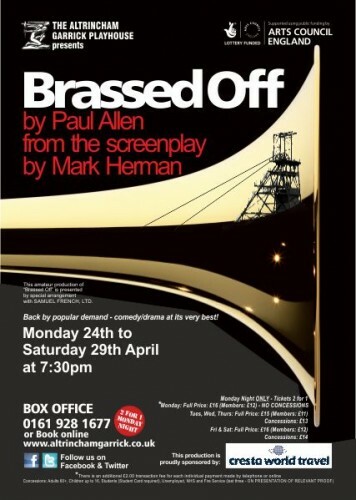 The arrival of Gloria injects some life into the players and the bandleader Danny continues to encourage them with the national competition, however the miners and their families struggle to cope with the immense frictions and pressures. Andy is a new member and when a Gloria shows up to play flugelhorn she causes a flurry in the all-male brass band and eventually hooks up with Andy but whose side is she on in the labour dispute.